Its been almost 2 months since the earthquake and tsunami disaster in Japan, and we’re not seeing a lot of coverage of what is going on at the Fukushima nuclear power station these days. So, I’m going to give a brief review of what happened in the first days after the earthquake and tsunami, and then what has been done since then to stabilize the plant. I will write a future post to outline the current plans to continue bringing the situation under control, as well as the impacts on people and the environment. I will assume that anyone reading this has already read my previous posts about Fukushima here and here and here and here, and so I will assume you are familiar with the terms, units and technologies I will be describing. Most of the information in this post comes from this powerpoint put out by TEPCO, the company that owns and runs the Fukushima Daiichi power station. I’m also relying on the website World Nuclear News, as well as the updates posted by the International Atomic Energy Association (IAEA). Photos and diagrams are from WikiCommons. To recap, after the magnitude 9.0 earthquake all affected Japanese nuclear power plants were immediately shutdown, stopping all fission reactions going on inside the reactors. 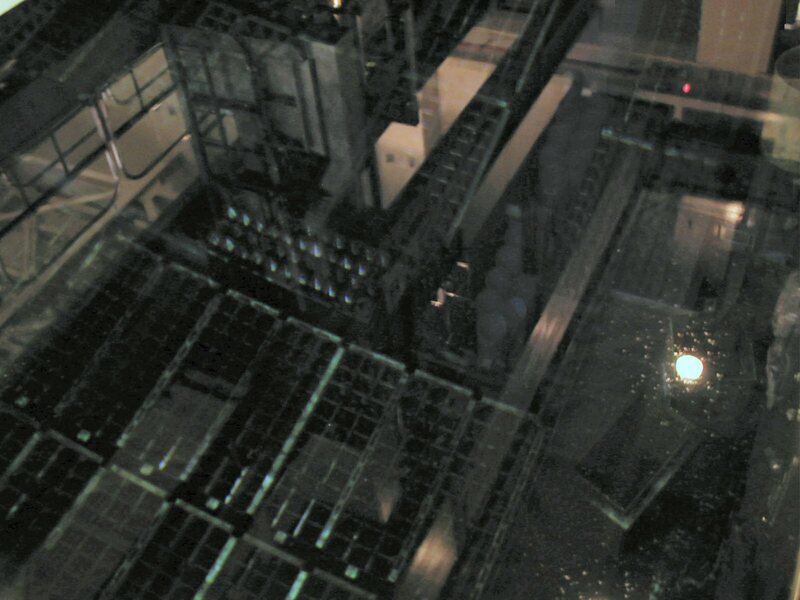 At Fukushima Daiichi, three operating reactors shutdown, along with a fourth that had been shutdown for a while with all its fuel removed and in a cooling pond. Emergency diesel generators started up to continue providing the necessary power to run the cooling pumps for the reactors. 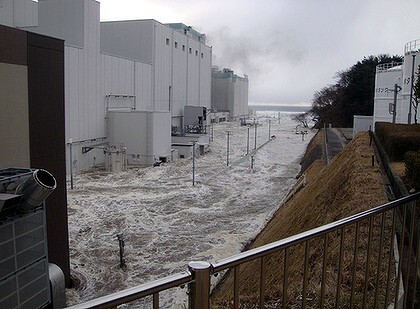 However, a 14-15 meter (over 45 feet) high tsunami inundated the plant minutes later, as seen in the picture below, knocking those emergency generators out of action. I’ve heard two reasons the generators were knocked out. One is that the electrical switchboards were shorted out by all the water, the other that the fuel tanks for the generators were either flooded with water, or floated out to sea as it retreated. In any case, as this point the plants switched to their last-ditch power supplies to power the cooling pumps, a bank of batteries sufficient for only 8-12 hours of operation. After those batteries ran dead is when things started to get out of hand. 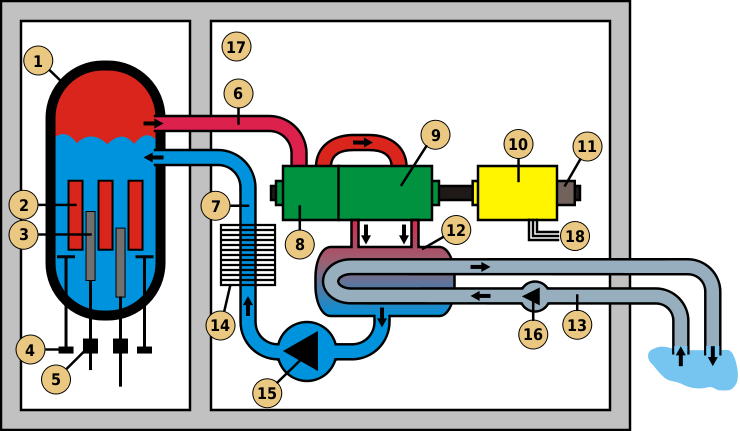 With no steady supply of cooling water into the three recently shutdown reactors (1, 2 and 3) heat built up inside the reactor pressure vessels (RPVs) (1 in the diagram above). As the water in the RPVs boiled off without any replenishment, the water level in the reactors kept going down exposing more of the actual fuel rods. Normally these rods operate partial out of the water due to the way a boiling water reactor operates, but water levels got much lower than normal. The fuel rods in the RPVs got so hot that they started to melt and deform. TEPCO estimates that in unit one 55% of the core melted down, puddling in the bottom of the RPV, in unit two 35% and in unit three 30%. There have been no indications that this melted fuel burned a hole out the bottom of the RPVs. As a result of the very high temperatures the fuel reached, the water molecules in the steam in the RPV broke apart, forming hydrogen and oxygen gas. This along with the water in the RPVs turning into steam caused pressure in the RPVs to increase to dangerous levels. These gases were vented into the primary containment vessel, a large concrete building built around the RPV, designed to contain any radioactive release. However, enough of the hydrogen leaked out of the primary containment (hydrogen is very hard to keep contained) to build up to explosive concentrations in the buildings atop units one and three. These explosions do not appear to have damaged the primary containment. With all this venting into the primary containment, radioactive fission products from the melting fuel built up in the primary containment. In units one and three, that is where most of those fission products stayed. However, unit two had a much worse problem. Instead of a hydrogen explosion outside the primary containment, it is strongly suspected that a hydrogen explosion occurred inside the primary containment vessel. This breached the primary containment vessel, allowing the release of all kinds of radioactive materials from inside the RPV. I’ll come back to this later. While this venting of steam and hydrogen explosions were going on, TEPCO workers were working mightily to restore some means of cooling to the reactors. Emergency diesel generators were flown in (the roads were impassable due to tsunami debris), and cooling was commenced using this emergency power to pump seawater into the reactors. Normally sea water is kept far away from any nuclear reactor because of the rapid corrosion is causes, but this was a far from normal situation. Workers kept pumping seawater into the reactors, where it then boiled away carrying with it various fission products that had to be vented to the atmosphere. This was the source of most of the early release of radioactive material from the plant. New power lines were also strung by March 20th to provide a reliable source of power for the pumps. This also allowed to restoration of power to the reactor control rooms and some of the instrumentation. Makes me cringe to imagine trying to fight this kind of disaster while in a dark control room, lit only by battery power lanterns with almost all of your instrumentation out of operation. There was also a situation developing at the cooling pond where the removed fuel from unit four was cooling off. The pool itself was possible damaged allowing water to leak out, and of course with no electricity to run cooling pumps, water temperatures here started to heat up too. The water in this pool started boiling, causing the water level to drop, possibly exposing the hot spent fuel to the air. Unfortunately, these cooling ponds are not within a containment vessel, so as the spent fuel continued to heat up, it began to release at least some of the fission products contained inside the fuel. There was also probably more hydrogen produced by the hot fuel, leading to an explosion in the building atop unit four, where this cooling pond was located. As time went by, the heat produced in the reactors decreased and the injection of cooling water caught up. Venting of steam and radioactive particulate was still necessary to maintain safe pressures. The cooling pond for reactor four was eventually refilled with water via various methods including helicopter air drops, fire truck water cannons, and finally by a huge concrete pumping truck. However, huge amounts of radioactive material was still being released from unit two. With the primary containment of unit two breached as I mentioned above, the extremely highly radioactive water was able to leak through into the adjacent turbine building. From there it was able to follow an underground tunnel carrying cable to seawater pumps near the ocean. See the diagram below. A crack in this tunnel allowed this radioactive water to pour straight into the ocean. The water in this tunnel was so radioactive, that radiation levels at the surface of the water were high enough (1Sv/hour, or 100 Rem/hour) to cause radiation sickness if a person stayed there for an hour, and a 50/50 chance of death if they stayed there for 5 hours. I believe this was the source of most of the radioactive material released from the plant. After several failed attempts to block the leak, the crack was finally filled with concrete, stopping most of the leakage. The seawater inlets and outlets were then plated up with steel, and sandbags filled with material that soaks up cesium (zeolite) were deployed to reduce the amount of radioactive materials being released to the ocean. At this point, the situation can be called cautiously stable. Power has been restored to all areas of the plant, allowing monitoring and cooling water pumping to continue. The biggest leaks to the outside environment have been stopped, but some radioactive material is still escaping. The RPVs are still above boiling temperatures, but they are gradually cooling. The unit four cooling pond is full of water again, and inspection of the fuel in that pond appear mostly intact. See the photo below. Sticky material is being spread around on the ground around the plant to prevent radioactive dust from becoming airborne, and radioactive debris on the site is being collected and disposed of. Efforts are ongoing to deal with the huge amounts of very radioactive water remaining in the basements of the primary containments and turbine halls, including the construction of additional holding tanks and water processing equipment. I think the situation can be called stable once the reactors get below boiling temperature so that venting steam is not necessary. That should stop most of the rest of the ongoing release of radioactive material. I have not seen when that is expected to occur. Tomorrow I will cover the impacts of this disaster on people and the environment, as well as the future plans to stabilize and clean up the plant. Thanks for reading.